Before you embed a Cloudinary video player in your own website or mobile app, take a look at some sample video player code and the video player that results from it. 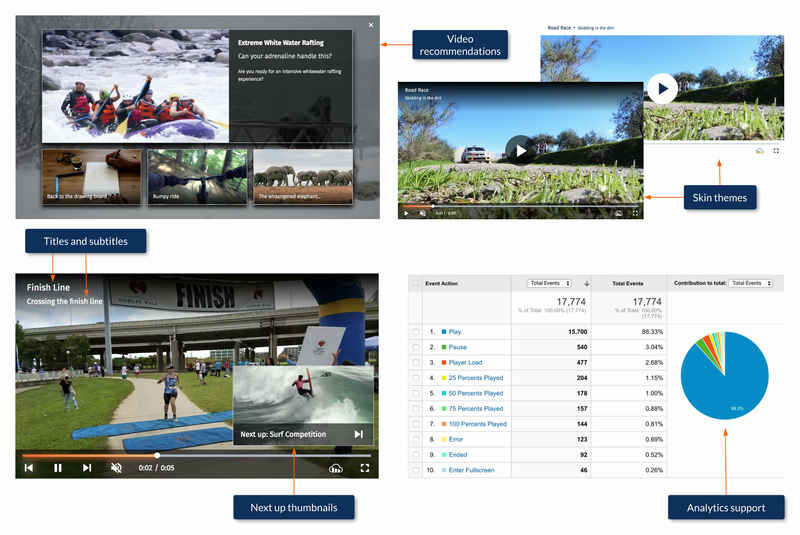 The Cloudinary video player is a feature-rich HTML5-based video player. This section summarizes its main functionality. Responsive device support: The webview player is designed for both desktop and mobile web browsers on a wide range of devices. The look and feel of the player adjusts responsively to the display size. Player controls: Built-in support of all standard player controls: play, pause, mute/unmute, volume control, loop, maximize/exit maximize, with the option for full customization. Player data: A small icon in the right bottom corner of the player enables users to view the video ID, dimensions, buffer status, and current volume. Video manipulations: Apply Cloudinary video transformations at the player level that will apply to all videos delivered in that player. Apply additional or override video transformations at the per-video level. Multiple players: Include multiple players on the same page, each with different configuration settings, or with different sources and the same configuration. Formats: Supports popular video formats, such as .mp4, .ogv, .webm, .mov. You can specify multiple formats and the player automatically selects the best format for the browser where it's playing. Adaptive bitrate streaming: Full support for HLS and MPEG-DASH including automatic generation of all required streaming representations and supporting files. Simple parameters to adjust skin themes, fonts, display of titles and subtitles and other basic player preferences. A smaller floating player that appears when the user scrolls beyond a playing video. Events that enable you to trigger operations based on both passive and interactive actions that occur in your player. Access to the underlying VideoJS API for low-level control or customization of any element of the player. Playlists: Pass a list of videos or automatically include all videos that have a specified tag. Display a scrollable playlist widget to the right or below your player and/or pop-up a Next up thumbnail a few seconds before the end of each video. Recommendations: Display recommended videos when a video ends. Monetization: The player is monetization-ready, with support for leading ad standards such as VAST, VPAID, and VMAP. You can also include ads via Google DoubleClick or AdSense. Ad options include banners and pre-rolls, mid-rolls, and post-rolls (with or without a skip option). Analytics: Monitor how many users are viewing your video and when, down to the level of any events you choose (start, pause, watched duration percentages, and more) and then pass the captured data to your Google Analytics account or other analytics trackers. The Cloudinary video player offers standard and light package variations, available in either minified or non-minified formats. Standard package: Includes all functionality described in this video player documentation, except MPEG-DASH support. You can add MPEG-DASH support separately to either package. To include a video player on an HTML page, you can either reference the relevant video player package files directly from Unpkg CDN or you can install the complete video player package locally and then reference the relevant local files. Afterwards, you can specify dash as the source type for your video source, as described in HLS and MPEG-DASH Adaptive Streaming. HLS support is automatically included in the video player standard package.